Our heartfelt thanks to these local business supporters of the FASF! Please support them with the same enthusiasm they’ve shown for us! 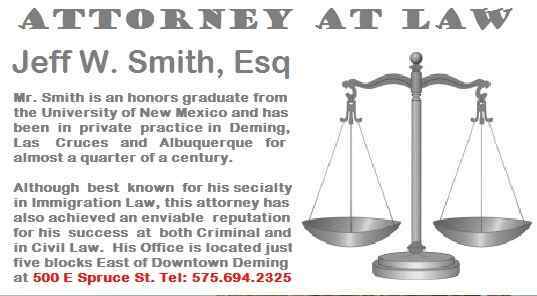 Ben Longwill is a licensed New Mexico attorney who specializes in Real Estate Law and Probate. He also actively defends clients who have been charged with driving offenses. Telephone Mr. Longwill at 575.524.4141 and arrange your introductory conference and explore this talented and colorful lawyer’s rich legal background and experience. Big O Tire Stores of Deming & Silver City NM – Owned and Managed by Megan & Cal Wenzel (above) – Tel: 575.544.2446 – Not just hard to beat deals on Tires, but all around complete automotive and truck services – at competitive prices – Click above photo for complete website and scheduling feature – Big O Tires is a national firm, so your tire warranties are good wherever you travel, not just locally! Megan is an active member of the FASF Board of Trustees. L to R above: Alejandra Sanchez, Administrative Assistant; FASF member, Bill Wallace , Columbus Stockyards Mgr. ; and Aidee Palacios, F. C. Felhaber Livestock Broker . . . Bill is a Trustee of the FASF. 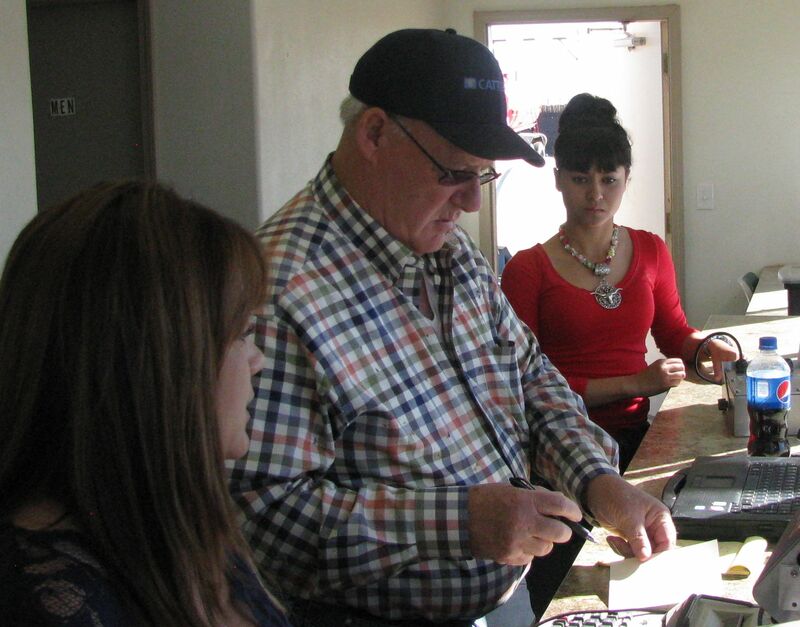 Foreground in picture at left, L to R: Aidee Palacios, Livestock Broker; Bill Wallace, Stockyards Manager, Alejandra Sanchez, Assistant to Mr. Wallace, and cattlemen, all busily occupied at the Import/Export Control Office and Weight Station . . . photo to the right shows Alejandra checking large livestock scale, as small group of cattle pass through for weighing . 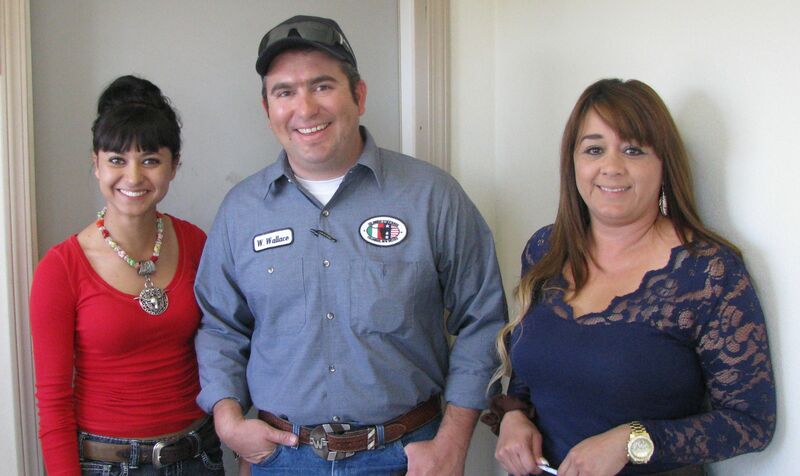 . .
L to R above: Aidee Palacios, Broker; JZ Smith, CATTLEMEX owner; and Alejandra Sanchez, Admin Assistant for Columbus Stockyards, working at facility’s high technology weight station . 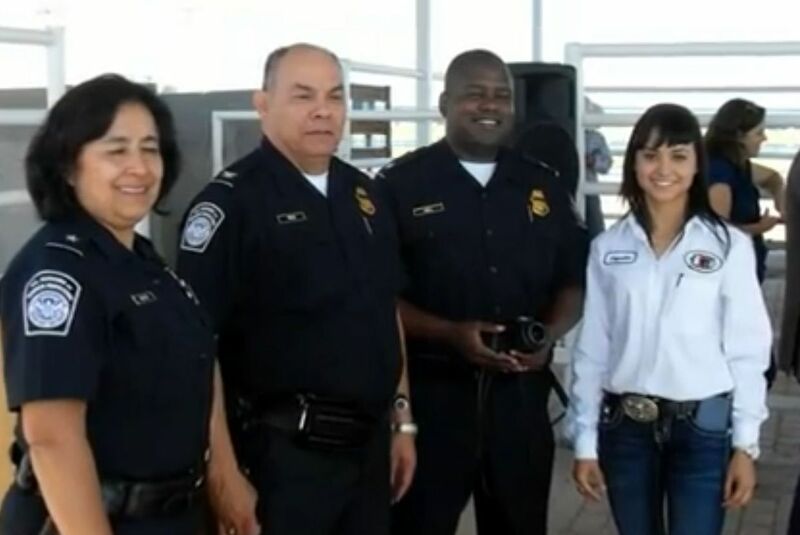 . .
L to R above: U.S. Customs Officials gathered with Alejandra Sanchez (right), during Grand Opening Ceremonies, September 2014. Deming is famous as the locale of the silver spike. In March 1881, the town became the site of the completion of the second transcontinental railroad, uniting the Atchison, Topeka, and Santa Fe Railroad from the east with the Southern Pacific from the west. Immediately adjacent to the Center you’ll find a relic of these days of yesteryear in the perfectly restored old Union Pacific cars and steam locomotive on display. In photo above in front office are (L to R) Susan Muñoz, Office Manager & CEO Javier Diaz – Top rated on both Facebook and Angie’s List. Complete well services, including Solar, Geothermal and conventional. D & J’s service area reaches out in a 100 mile radius from Deming, but this professional operation also serves Hidalgo, Grant, Sierra & Doña Ana Counties. However D & J has also been known to bid beyond this distance. Their main offices are at 2600 Columbus Rd. 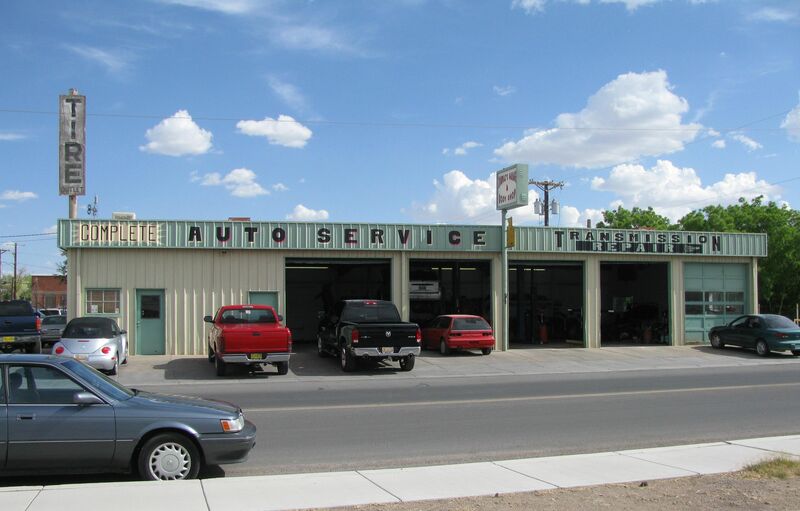 SW, Deming, NM 88030 Hours: M – F from 8:00 to 5:00Tel: 575.546.7221 – Five out of five stars rating on Facebook! Javier also happens to be one of the publicly elected Luna County Commissioners. Diaz Farms – Fresh Locally Grown Produce – A three generation family farm, owned and operated by Eddie and Guillermina Diaz in Deming, New Mexico – Telephone: 575.546.7264 – Located at 2485 Silver City Highway in Deming. – Diaz Farms is famous for their champion caliber green and red chile, but also well known for their flavorful onions, melons, pinto beans and many other types of produce. Need hay? Come to Diaz for good quality and competitive prices! Enjoy watching your chile roasted while you wait – or buy your order from already freshly on-site roasted stock. FASF member Eddie is the brother of Javier Diaz of D & J Pump & Well Service (above) and is also the Assistant Treasurer of the local electric utility, COLUMBUS ELECTRIC (see above). Pictured above, standing on the porch of the offices for the Sales & Service facility of “E&G Wireless” in Columbus, are (L to R): Gracie Carreon, Manager; Mely Gonzales, Service Representative, and Veronica Pelido, an E&G customer. E&GWireless is one of our newest FASF Business Supporters. The company is owned and managed by Gracie Carreon of Columbus. The enterprise was the exclusive idea of this young Columbus native. In spite of predictions by some area wireless communications “experts” that such a new business couldn’t succeed in Columbus, it has – – – and how! Gracie was certain that the town of Columbus could use its own wireless service and sales facility and it would appear that her instincts were right, because E&G has managed to grow and thrive in the two and a half years since its humble beginnings from her home. Gracie personally showing one of her customers some of the many cell phones she offers. Gracie (L) checks Mely’s (R) calculations and data for one of their customer’s accounts. After only about a year from her start up at home, the business grew so fast that it was necessary to purchase and set up her own free-standing office building, which she did, right alongside the Columbus Highway a few short miles North of the center of town. This innovative young entrepreneur has managed to more than just succeed, she has flourished and grown as few expected was possible. Her company’s slogan is: “Big Enough to Serve, Small Enough to Care,” and that accurately describes Ms. Carreon’s operation, already approaching its third year of successful sales and exceptionally friendly service. If you’d like to explore and possibly purchase one of Gracie’s unbelievably low cost Cell Phone service plans and/or some new or used cell phone equipment, you can either stop by in person at the above office at the Southeast corner of the Columbus Highway and West Carter Avenue, so that Gracie or one of her gracious staff can show you the many possibilities available, or call them at (575) 545-3719. E&G’s friendly staff are all bilingual, speaking both English and/or Spanish. Please to stop by and discover for yourself why this Columbus Wireless company is growing so explosively. Their hospitality and friendliness are genuinely unparalleled – – – and E&G’s prices are amazingly competitive! See the story about Gracie Carreon’s entreprenuerial success story under our “INSIGHTS” Column (found under right side bar menu under “MORE TO SEE“). ELITE AUTO CARE – TOYOTA Factory Trained – Master Diagnostics Specialist – 30 Years TOYOTA Experience – Specializing in LEXUS, TOYOTA & SCION – 4451 Edgar Park Ave., El Paso, TX – Tel: 915.757.3500 – ELITE has customers from Las Cruces, Deming and Columbus, as well as West Texas. Their Facebook rating is five out of five stars! Owned and managed by Mike & Beverly Wilkerson. GUTIERREZ ENTERPRISES – Pictured on top is Yoya’s Convenience Market, Gas Station and Splash Car Wash, all locally owned and operated by Salvador “Sal” Gutierrez and family. Not only is Yoya’s Market named in honor of Sal’s wife, but you can often meet her there at this, Deming’s busiest convenience store, working with her friendly staff. When you need a fast and economical vehicle lube, stop by Thunderlube and Car Wash on Deming’s East side and you’ll find Sal managing this high speed service facility. Yoya’s is located just below the intersection of Florida Street at 1620 South Columbus Road and the Splash Car is adjacent to and immediately South of Yoya’s. To get that speedy vehicle lube, drive East on Pine Street to1900 E. Pine. To make a reservation for your lube work call Sal at 575.544.3918. Yoya’s phone is: 575.546.4109. Sal has another self-serve car wash facility, which is located on the SW corner of Spruce and Pearl Streets near central Deming, in case you’re ready to clean your car or truck and are in that neighborhood. In April of 2015 Sal and Yoya are opening Deming’s newest full service grourmet Mexican Restaurant, a truly exquisitely furnished and elegant upscale facility immediately South of Yoya’s Market and Service Station. The First Savings Bank (FSB) of Deming is connected with a number of other FSBs throughout the western United States, with branches in South Dakota, Minnesota, Illinois, Iowa, New Mexico, Nevada, Texas, Nebraska, Arizona and Colorado. Managed in Deming, NM by President Josh Plasencio, a personal member of the FASF, the Bank prides itself in its personal service. Located in central Deming, its friendly staff wants to meet you and show you how it can help meet your banking needs. The President of First Savings Bank, Josh Plascencio is, as the Corporate Secretary, an active Officer on the FASF Executive Committee, and a member of its Board of Trustees. Commitment is a simple word, but it describes the FSB’s guiding business philosophy. The bank is committed to providing the very best in service and products to its customers and their local communities. The Bank considers itself a part of each community in which it does business and endeavors to take an active interest helping improve and develop each community. These days, big banks just keep getting bigger, and they tend to know less about you – and your community. The FSB is proud to be a community bank and to be family owned. FSB is strong enough to stand on its own, yet small enough to appreciate the daily details and real-life needs where its employees and staff work and live. First Savings values its customers; offering them personalized attention – which it backs up with full banking services and innovative products. The fact is, the FASB wants to be your bank. It wants to earn your business and handle your banking needs with the attention and respect you deserve. Friends of Pancho Villa State Park – Melody Taylor, President: John Read, Park Manager. This park remains the southernmost state park in New Mexico and it offers a broad range of facilities for both short term and long term visitors to this historical corner of the Land of Enchantment. With full and complete RV and camping amenities, the park also presents a modern exhibit hall replete with a wide range of artifacts and other memorabilia from the 1916-17 era of the famed Punitive Expedition led by General “Black Jack” Pershing deep into Mexico. It even presents a full scale replica of the famous “Jenny” airplane that helped make Columbus known as the birthplace of American Air Power. Visit the linked website created by the “Friends of the Park,” a docent group of volunteers dedicated to serve and help educate the public and many visitors to this unique attraction. Call 575.531.2711 for more information. Patio has two restaurants for your convenience: The above photo shows two views of the downtown Columbus restaurant. The Patio in Deming is located at 1521 Columbus Rd, Deming (on the SE corner of Columbus Rd. and Florida Streets) and in Columbus at 23 Broadway (above) in central Columbus. Their burgers have become legendary in both Deming and Columbus and their informal ambiance relaxing and enjoyable. For hours and other information you may call them at: 575.546.5990 for Deming and 575.531.2495 for Columbus. Terry Castillo is in charge and serving her popular “Terry’s Burgers” in Deming, while daughter Missy is in charge at the Columbus Patio. PC CONCEPTS is Deming’s only stand alone, home owned and operated PC repair facility now operating anywhere within 50 miles of Deming, yet prices are still competitive. Owner Thom Barry is a decorated Marine Corps veteran of the Vietnam Conflict. If this skilled technician doesn’t do your repairs personally, he makes sure they are done properly by supervising and testing all work’s results for accuracy. While other computer repair service centers have come and gone, Thom has remained open and operating, even when his business grew so much he had to move into his new larger headquarters on East Spruce Street in downtown Deming, only four blocks from the center of town. If your machine is down and in need of work, please bring your computer to Thom to obtain an estimate for repairs. The shop is located at 420 East Spruce Street, Deming, NM, and you can call Thom at: 575.546.6112. You’ll get fast, courteous, and professional service – – – at a genuinely reasonable price! Deming’s home grown – and owned – popular Supermarket! 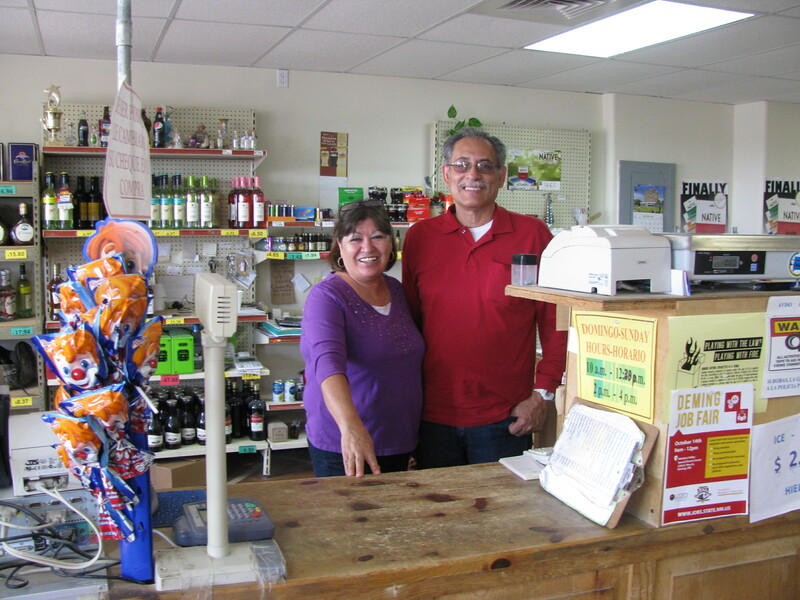 Roberto and Isabel Gutierrez, of Columbus, owners of the town’s principle grocery story, the SAN JOSE MARKET & LOUNGE, have just come aboard as Local Business Supporters. Like our own Treasurer, Alma Villezcas, Roberto was born in the city which housed the United State’s first foreign Air Base, Casas Grandes, Chihuahua, Mexico. When still a boy, his parents moved North to the border and sister town to Columbus, Palomas, Mexico where they opened up both the town’s first Pharmacy and then its only Movie Theater. When living in Palomas, young Roberto commuted during school days to classes at the Columbus Elementary School and later to Deming, to attend their High School. Above, standing behind one of their Grocery Store’s cash registers, are Isabel and Roberto Gutierrez. Sun Valley Hardware bills itself as “The Worlds Largest Hardware Store!” Drop in and see for yourself how extensive and complete their stock of hardware is. 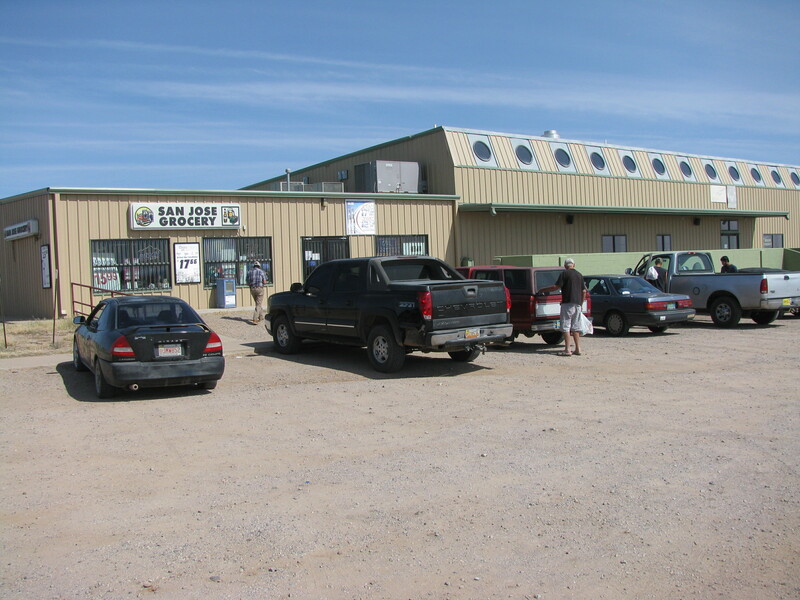 You’ll find this popular store conveniently located at the South edge of town at 1700 Columbus Highway, just South of the intersection with Florida Steet. Managed by Bryan Reedy and staffed with a knowledgeable and friendly team, you’ll find this store ready to serve you quicky – and with competitive prices. Check their website by simply clicking on the photo above to find out their hours – and to also search through their convenient on-line catalog – or call them at: 575.544.300. Sun Valley also has popular stores in Hatch, Silver City, Mesilla Park, and Truth or Consequences, NM. HIGHLY ACCLAIMED AND RENOWNED COLLECTION OF PRE AND WWII AIRCRAFT! Zumwalt’s is a family run enterprise, one that dates back 39 years, when it first began to meet the local automotive needs of this growning Southwest New Mexico city. Started by Delbert Zumwalt, it has grown and prospered in the years since it first opened its doors. 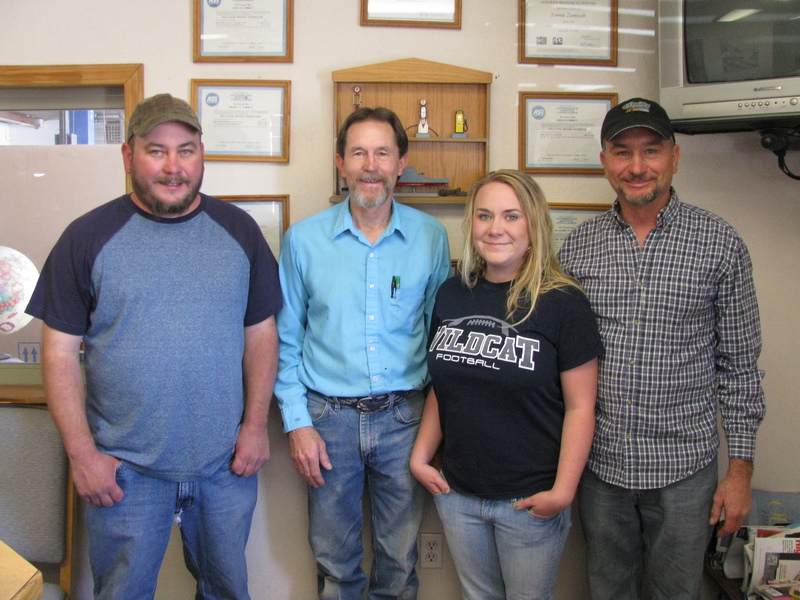 Now managed by its current owner, Lonnie Zumwalt, pictured at far right above, the founder’s son, it is now staffed by two of his daughters, Chelsea pictured above, and Lindsi, as well as by his son, Chad, on the left above. Even Lonnie’s brother, Dwight, in the light blue shirt above, plays a vital role in the business’ daily operation. This family operated facility has steadily grown as the result of its attention to detail and by way of its personal and family oriented interest in each of its loyal customers, who have continued to return, year after year, whenever their vehicle has needed the renown Zumwalt personal touch. Please drop in, if you’re not already a steady customer, and see for yourself why this family enterprise has gained such a remarkably outstanding record for exemplary service at economically competitive prices. If your problem is with a car or truck, large or small, foreign or domestic, Zumwalt’s has the highly trained and skilled technicians you’ll need to help bring your vehicle back to dependability. Below is the Zumwalt main facility, conveniently located near central Deming. 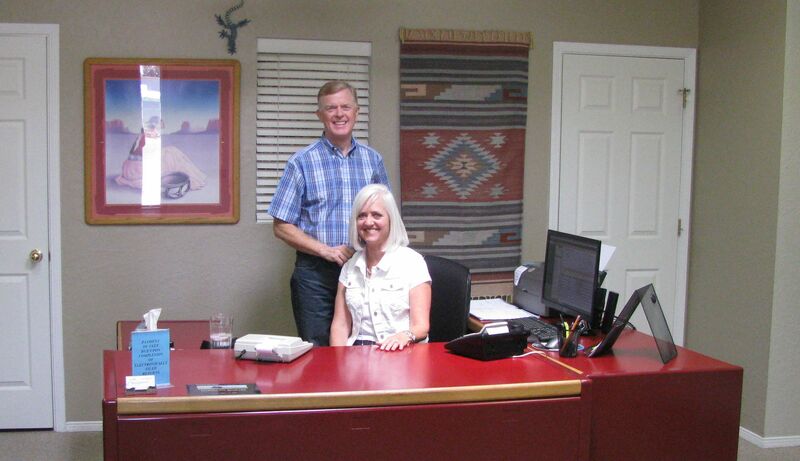 Zumwalt’s Garage and Collision Center, 520 E. Spruce Street, Deming, NM 88030: Lonnie Zumwalt, Owner. Telephone 575.546.8861 – Zumwalt’s provides all categories of automotive service, including wheel alignment, transmission overhaul, and body restoration services. Conveniently located only five blocks East of downtown central Deming. This entry was posted in LOCAL BUSINESS SUPPORTERS on June 18, 2014 by FASFRIC.